The Danger Of "inflation Adjusted Graphs"
Just a reminder here. If anyone can tell me how their savings or wage increases can keep up with inflation, I am all ears. Therefore, The inflation adjusted HPC graph should be treated as a guide, NOT the holy grail. Why has the non-adjusted graph been removed from the graphs page? The Non-adjusted for inflation graph, shows the 90s crash with 25% fall from peak to trough. The inflation adjusted graphs surely only applies to people whos savings and incomes keep up with inflation or better. How many people is that relevant to? Before the government withdrew them because it saw the inflation forecasts. I very much agree with the title of this post and the sentiment and it is key thing to keep pointing out. In past crashes house prices never really fell much in nominal terms, they just tended to sit still whilst everything else including wages shot up - which in real terms is a fall in house prices. There is a good chance the same will happen again this time, especially if the whole QE thing keeps on going. Tying to inflate through QE is like pouring petrol on an unlit bonfire. You can keep adding fuel and nothing happens, but eventually someone will strike a match and its at that point you'll see the effect of all the fuel be iut QE or petrol. So for now we seem to be stuck in a debate between nasty cost push inflation, driving up fuel and food whilst wages stay static and everyone gets poorer perhaps ultimately leading to a deflationary scenario where assets and wages etc keep falling, or we are just going through a bit of a stagflationary pinch (low growth and higher cost push inflation) before the QE impact kicks off big style. I think it is safe to say that the majority of investors were aware of this. Whereas some STR's and potential FTB's may find this challenges their expectation of what should have and hasn't quite happened\ yet. Bardon indeed, I do feel some sense of duty to explain this and make sure people don't get burnt as a result of misunderstanding this. We are not saying house prices only ever go up, which is a piece of simply distilled sheeple non wisdom. What we are saying is that over the long term the nominal price of houses will go up because the system is rigged to increase the money supply - however on the way there houses will often race ahead of inflation (as they have done) and so at certain points they have to slow or fall a little to allow the rest of the economy to catch up. In many ways the 2007-9 falls were unprecedented, but largely the result of a real fall taking place in a low wage inflation environment. I was lucky enough to call it right this time round, but got fractionally burnt in the 1990s by holding off from buying a little too long thinking "the recovery" would petter out and that all bankers were dead meat. The key to understanding this is that money is not real, it is just an accounting token that costs nothing to produce. Of course you can suffer if you don't have enough of it as it used to trade all goods and services in our economy, but the key point is you have to look at who is controlling the issuance of these tokens and why not issuing enough might result in bad things happening to them. Except little or no wage inflation. My salary has been permanetly frozen. If I want an increase I will need to find another job or seek promotion. So there had better be nominal falls otherwise those in my position will be well stuffed. In nominal terms from todays prices, where do you see house prices going over the next 2-3 years, say ? Do you see a slow grind downwards, as wage inflation stagnates and (as you mention) house prices are caught up with the rest of the economy ? Stagnation, followed by a spike as the QE effect kicks in ? 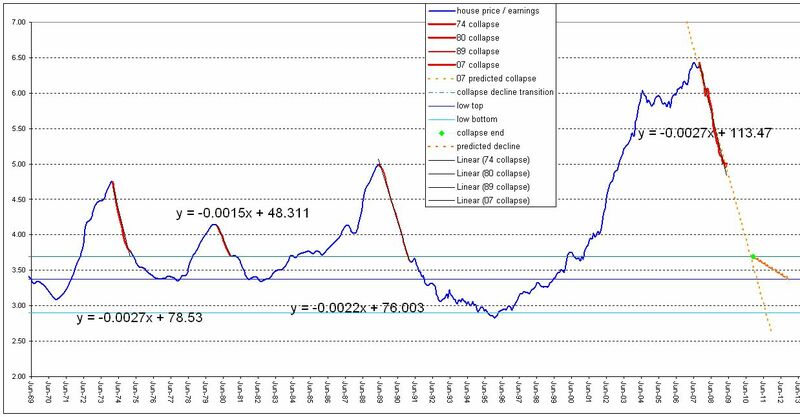 With the current situation, though, it has to be taken into consideration that the 2007-09 price fall saw house price fall by about 20% in nominal terms (so large nominal falls can't be ruled out) and we currently have wage deflation, not wage inflation. Also, in the US, Spain, Dubai, Ireland, etc., since 2007 house prices have fallen between 30%-50% - what proportion of these falls have been nominal? I agree too, and have pointed this out before. Inflation has been likely 6-7% p.a. for the last decade. Looking at any chart adjusted for the govts. official inflation measure is going to paint a dangerously misleading picture (crash or not). Not just houses, but more importantly wages. The reason we're moving towards a lower level of home ownership is 'cause we're all (except the elite) being impoverished relatively. With respect, you are deflating by the wrong thing. The UK has had consistent long term economic growth of 2-2.5% per annum since the start of the industrial revolution 200 years ago, consequently average wages have increased at a similar long term rate. This has been equally true of periods with high inflation as well as those with low inflation. As a consequence, though it is difficult to credit this on a day to day basis, wage inflation has consistently beaten price inflation by a couple of percentage points a year. The consistent reversion to troughs of 3 to 3.5 times average salary confirms very clearly that house prices, in the long term, are priced as an item of consumption. They are only an investment in the short term, as long as you can buy in the dips and sell at the peaks. I last updated this graph prior to QE starting, which put my 'predicted collapse' on hold. Once the Nationwide data has started falling solidly again I will do an update. wage inflation has consistently beaten price inflation by a couple of percentage points a year. I have gone away and pondered this. If the statement was true, then one adult could raise a family without all the current benefits, tax credits, loans and credit cards. I also therefore question the wage figures (government inflated?) used in house price/wage graphs, just like with the accuracy with the figures used for inflation. Wasnt there a £10k limit per issue? Not much use for those of us with six figure deposits. Ok, might put us a few hundred quid ahead, not much in the grand scheme of things though. Relative and absolute poverty are different things. Fifty years ago only the wealthy had cars, fitted carpets, colour televisions, foreign holidays, inside toilets, plumbed in baths, central heating etc. The rise in absolute wealth has been substantial. Relative poverty stays the same, and the percentage passed on in benefits stays the same. One adult has never been able to raise a family by themselves unless they had a grandparent to look after their children while they worked. As recently as 'Cathy come home' the children would simply be taken off the mother and brought up on the very cheap in institutional homes. The fact that people were so much poorer was a reason that single families were so rare, women put up with beatings at home because there was no alternative. Two adults on average income can raise a family without benefits now and then, and enjoy a lot more wealth than in the past. Each issue was two parallel issues - 3 year and 5 year, £15k each. One roll-over allowed so you can hold for up to ten years. More than one issue a year. £30k every 9 months or so soon mounts up, easily into six figures. IIRC the maximum nominal you could theoretically hold (it peaks where the amount maturing at second roll-over and coming out equals the amount you can put in) was nudging £300k. I didn't quite make that but the value is approaching £250k. Unfortunately it will now just start coming out again. So £11k cash in hand difference, slightly more than "a few hundred quid". Any whiff of deflation and they can come straight out, no notice required. Your predicted collapse to 3 to 3.5 times average salary is rather interesting. How do you expect this to happen with regards to interest rates? After ZIRP and Queasing, we have had a rally. The reason why the size of the bubble was so much bigger than the other times was low interest rates. So why shouldn't the trough be similarly higher this time? Yup. A sudden increase in the velocity of that money already printed. Just as long term real growth rates have been 2-2.5%, long term real interest rates have been consistently about 3%, again inflation doesn't affect this long term. In practice real IR's need to go up above 3% in the booms, and should be dropped, going negative if necessary in the recessions. People forget that we were facing real deflation two years ago - wages in particular were falling significantly. Deflation forces real IR's up, totally inappropriate in a recession. Faced with this the BoE used QE to artificially create the equivalent of negative interest rates. And although this cost me £6k+ in extra rent with the postponed crash, I think it was the right thing to do. As the economy picks up; and it will pick up, real IR's will need to rise to 4-5%, it could take a while to get there, but it will happen. In the meantime, you don't need high IR's to restart the crash, just an absence of the liquidity created by QE. Prices are way too high, ftbs are priced out, and availability of mortgages has collapsed again with the withdrawal of QE. The market will collapse of its own accord, as the economy picks up rising real IR's will keep it collapsing. 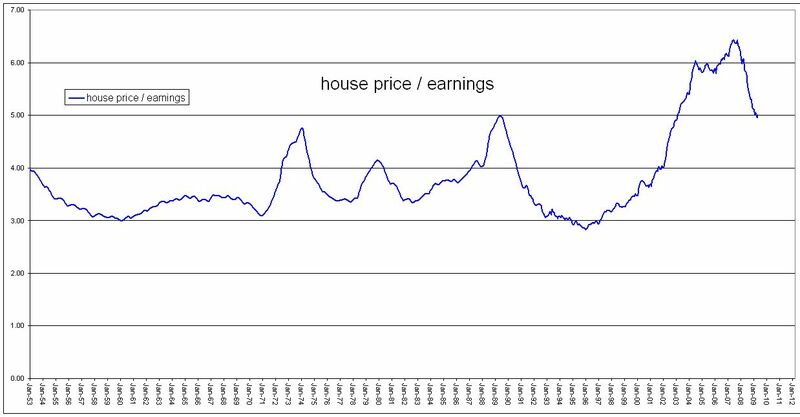 In past crashes house prices never really fell much in nominal terms, they just tended to sit still whilst everything else including wages shot up - which in real terms is a fall in house prices. There is a good chance the same will happen again this time, especially if the whole QE thing keeps on going. Tying to inflate through QE is like pouring petrol on an unlit bonfire. This is the soft landing all the boomers are dreaming off. It forgets one minor problem. The ability to inflate away house prices was eliminated when the Chinese built their first power station, and all the jobs started going east. Everyone needs to stop dreaming. Wages aren't going to rise, because anything done here can be done cheaper in China or eastern Europe. No magic Gennie is going to come along and take away all these debt. Were going to have to pay them. The 3 to 3.5 times average single FT salary effectively reflects the banks lending practices at the time. That would suggest the long run average is now closer to 4.5 on that graph, based on an average FT salary of £25k ? I'm sure there are a load of flaws in that simple calc, could someone point them out to me ?